Update: Just use the 8.40.10 final release now! With the recent release of JDK 8u60, a lot of people are reporting that ControlsFX no longer works. This is because private APIs that ControlsFX depends on changed in 8u60, and as such we have needed to update our library to deal with this. For those of you who are using JDK 8u60 and want to make use of ControlsFX, please use the latest 8.40.10-SNAPSHOT builds that are available on Sonatype. ControlsFX 8.40.10 will be released in the next few months. There are a lot of pull requests to merge, and this release will probably be quite a feature-packed release, if the community contributions are anything to go by! Also, Eugene and I will be presenting about ControlsFX again at JavaOne this year, so if you are attending, be sure to come along and say hi! This release has been a long time in the making – I must apologise for the delays. However, today is the day that I am pleased to announce the availability of ControlsFX 8.40.9. This release is the first release to baseline on JavaFX 8u40, and brings with it hundreds of bug fixes and usability improvements. This release is not a major feature release, but don’t let that dissuade you from downloading and using in place of the previous releases. For those of you stuck on JavaFX 8u20, we’ve also released 8.20.9, but this will be the last ControlsFX release for JavaFX 8u20 – all future releases (for now) are baselined on 8u40. The main champion of this release is Samir Hadzic. He has almost single-handidly brought this release to life, pushing hundreds of bug fixes, not just in his SpreadsheetView control, but across all of ControlsFX. So, from myself, Eugene, and the many thousands of developers and users of ControlsFX – a massive thank you to Samir! Other contributors to this release include (in no particular order): Dirk Lemmerman, Geoff Capper, Eugene Ryzhikov, Roger Terrell, Robert Lichtenberger, Anirvan Sarkar, Márcio Carneiro Rodrigues, Nicolai Parlog, Andreas Liebelt, Cole Markahm, Danno Ferrin, Jeff Plourde, Steffen Rachner, Jason Pollastrini, Lukasz Sliwinski, Ralf Schmitt, Thijs Walcarius, and James Denvir. On top of this is our excellent translation team, who translated this release into 23 languages. A huge thank you to everyone who contributed! It’s time for another ControlsFX release, this time taking the version number on another jump up the scale and finally settling on version 8.20.7. What this version number represents is the fact that this release requires JavaFX 8u20 and will not work with earlier versions. If you want to use ControlsFX with JavaFX 8.0, you will need to use ControlsFX 8.0.6. This release has been brewing since 8.0.6 was released on May 29th – so basically four months. This is not typical for us (we normally have much quicker releases), but Eugene and I were both distracted on a major undertaking – elevating the ControlsFX dialogs API and implementation into the next release of JavaFX itself (it’ll be appearing in JavaFX 8u40, although the API is vastly different than what you see in ControlsFX 8.0.6). The end result is that we iterated through a bunch of API design work (see RT-12643) and none of that benefited ControlsFX, but it took up all our time. ControlsFX 8.20.7 has an external dependency on openjfx-dialogs, but this will only be the case until we baseline on JavaFX 8u40, at which point it can be removed. ControlsFX 8.20.7 ships with two dialogs APIs! The saving grace is that the old one is still fully functional but deprecated – hopefully that will give you enough of a hint that the old API will go away in a future release. The nice thing about openjfx-dialogs is that people wanting to use the new JavaFX dialogs API in 8u20 can do so – just download the jar (or set it as a dependency) and you can use the API (and implementation) exactly as it will be in 8u40. This is great for me – it gives me more testers of the JavaFX dialogs API and implementation – hopefully you can file bugs if you run into them. What else is new in ControlsFX 8.20.7? The status bar control was contributed by Dirk Lemmermann. It is normally placed at the bottom of a window. It is used to display various types of application status information. This can be a text message, the progress of a task, or any other kind of status (e.g. red / green / yellow lights). By default the status bar contains a label for displaying plain text and a progress bar for long running tasks. Additional controls / nodes can be placed on the left and right sides. Improved glyph font support, including support for the latest FontAwesome release. Improved build system – we now have just one gradle project that can work with ControlsFX, ControlsFX-samples, and FX Sampler. 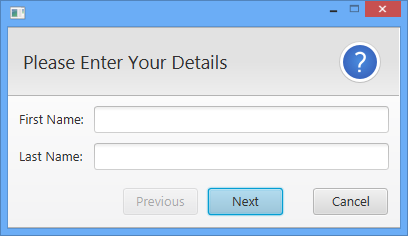 Action and Dialogs API refinement, based on our work moving dialogs up to JavaFX 8u40. 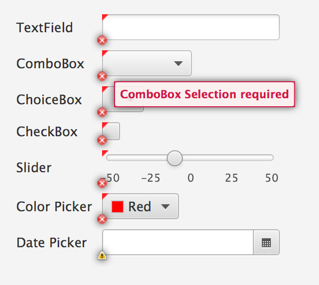 New CSS tab in FX Sampler – now FX Sampler can not only syntax highlight the code of a sample, it can also syntax highlight the CSS of the control. The validation API now supports regular expressions and predicates. Improved internationalisation support – we are fully integrated with Transifex, and the community is always welcome to help translate. Big performance improvements in SpreadsheetView. RangeSlider is now a lot less finicky about setting min / max / high / low values. Lots of bug fixes, particularly in Dialogs, Actions, SpreadsheetView, as well as the Check* controls (CheckListView / CheckTreeView / CheckComboBox). That’s all for this release – we hope you appreciate all the hard work that the team is putting in to ControlsFX, and that you might consider offering bug fixes or bug reports. If you want to get involved, check out our documentation that describes everything that you need to know to get started. Wow – this release of ControlsFX is a big one in all respects! It took just shy of three months, consists of nearly 500 changesets, has been translated into 17 languages, and includes a huge number of bug fixes and new features. This is going to be a long post, so strap yourselves in and please read to the very end – this release has some important changes! This release also continues in the long tradition of being a real team effort. ControlsFX wouldn’t be where it is today without the hard work of the following contributors: Eugene Ryzhikov, Samir Hadzic, Gabriel Féron, Carolina Veiga, Anirvan Sarkar, IsNull, Artur Biesiadowski, Yair Oren, Davide Nabais, Tom Eugelink, Michał Skowroński, Uwe Sander, Laurent Gebus, Geoffrey Capper, Romain Moreau, Mario Voigt, Ruben Paz, Jonathan Millman, Chen Gaofeng, Ladislav Török, Tiziano Lattisi, Victor Alfonso Pineda Orozco, Daniel Rodrigues, Avramucz István, Sriram Raghuraman, Dirk Lemmermann, Florian Brunner, and Christian Michelsen. Apologies if I missed anyone! As always, if you see these people walking down the street, give them a high-five or a knowing wink, as in to say “You’re a cool person – I appreciate your hard work”. With that out of the way, lets dive in. I should start by saying that this release was largely about consolidating what we had, so most of our focus has been on improving the quality of the release, and slowing down the introduction of new features. This approach will continue in future releases, as I don’t want to let the quality of any release fall below a (very high) threshold. This release was largely focused on decoration and validation. We already have plans for future releases – if you want to know more, it is a good idea to join our google group. ControlsFX 8.0.6 introduces a brand new (and at this stage relatively simplistic) decoration framework, to allow for developers to apply decorations to nodes on screen. 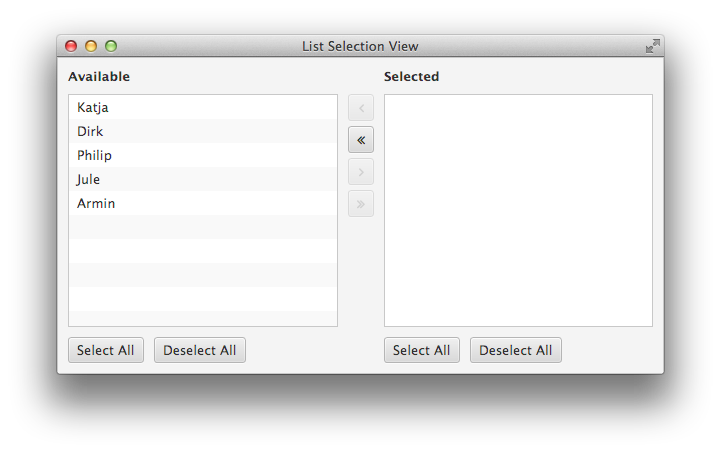 For example, you may want to show graphics in the corner of your nodes, or add a styleclass in certain circumstances. The decoration framework makes this kind of action trivial. However, to be fair, the decoration framework was primarily developed to be the visual feedback mechanism for a validation framework, and we have one of those in ControlsFX 8.0.6 too (read down a bit further to see screenshots of it in action!). SnapshotView – the ‘Controls’ section of the image has been selected. We did a big push in ControlsFX 8.0.6 to externalise all translatable strings, and to get the community to help translate these strings into their local languages. I am so pleased to say that the community did an excellent job, resulting in ControlsFX 8.0.6 being translated into 17 languages! Hopefully in future versions we can take that number even higher, but for now we really do have an excellent amount of language coverage. As mentioned above, we introduced a decoration framework in 8.0.6, primarily to enable the validation framework. The validation framework helps developers to validate user input and assists with reporting errors and warnings. It is designed to be lightweight but extensible, and will grow over time as developers suggest desired functionality (we are definitely open to suggestions!). Graphic decorations showing how validation failed. CSS decorations showing how validation failed. The SpreadsheetView continues to be improved – performance is better, functionality is greater, and API is becoming more polished. It is now possible to specify the effect to display when a lightweight dialog is shown (rather than the default gray background). The FXSampler project (which is a standalone project that you can use to demonstrate your own JavaFX stuff!) now has support for custom welcome pages. Very cool! The login dialog shakes (almost mockingly) when you type in the wrong username / password combination. The PopOver control got some useful bug fixes and additional API for hiding PopOver. There is always a tension when working on API between retaining a stable API and continuously improving the API. 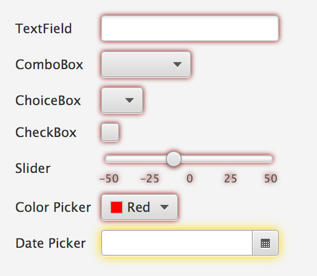 Believe me, I’ve heard all arguments in my work on JavaFX UI controls! Unlike JavaFX with ControlsFX we are a little more flexible with our backwards compatibility requirements. In other words, I am more than happy to break API to get a better API. This release is by far the biggest release for breaking API, so I want to spend a few moments outlining the major changes, and what you need to do to upgrade to ControlsFX 8.0.6. Previously the Action interface had an execute(ActionEvent) method, but it seemed pointless to roll our own API when, by extending EventHandler<ActionEvent>, we could directly install an action into, say, the Button.setOnAction(EventHandler<ActionEvent>) method. Unfortunately, EventHandler has a handle(ActionEvent) method, so this means that in all cases where you had Action code, you simply need to rename your execute method to handle. In other words, code that previously checked for null will now no longer work, as the returned Optional will never be null! You need to instead operate on the Optional instead, as shown above. As per usual, more details about getting and using ControlsFX can be found on the ControlsFX website. You can also read through a high-level summary of all the features in this release, and peruse the JavaDocs (where we put the bulk of our documentation) if you want the gritty details. From all the ControlsFX contributors, we hope you enjoy this release, and we hope that you may consider supporting the project in the future!